Biowatch, founded by Matthias Vanoni – former PhD of the Idiap Research Institute and biometrics specialist -, proposes an identification service for wearables using the unique vein pattern. Recapp, led by David Imseng – also a former PhD of Idiap -, has developed a system that recognizes words without preliminary training. The system is capable of analyzing and transcribing the text recorded and is also available for rare languages and dialects. DigitArena allows substituting an advertisement at the edge of a soccer field by another one in real time. Currently, the technology is in the final phase of development at the Idiap Research Institute and should be available by August 2016. 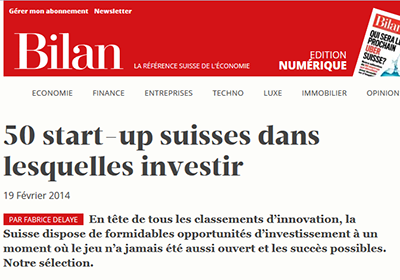 Reference: Bilan magazine "50 start-up suisses dans lesquelles investir"